Revitalise your skin and get it looking healthy once again with the range of skin care products from Australian Bodycare. The use of tea tree oil within the range is proven to be the most beneficial for our skin. Australian Bodycare is designed not only to upgrade your daily routine, but to also target certain skin concerns you may have. Browse the full range below, including tea tree oils, facial cream and washes, plus their antibacterial spot stick to help calm skin and reduce the appearance of blemishes. 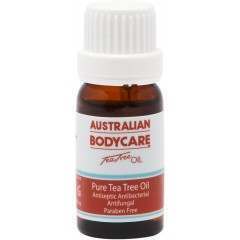 Australian Bodycare have been a brand leader on Tea Tree Oil products since 1992, showcasing their expert products for safe, daily use for all the family ever since. Simple and straightforward to use, their range of expert tea tree oil products are beneficial for all skin types. Their range of products can be used on a daily basis to help clear skin of any blemishes and odour causing bacteria, but also just as and when you need to. From facial creams and body wash, to spot sticks and their fantastic oil, the range is suitable for everyone all year round.